ASIAN KUNG-FU GENERATION are a highly successful Japanese Indie band who can trace their heritage back to the days of the mid-1990's when they came together as friends at college sharing a similar taste in music. And in early 2015 they came together in Los Angeles to record their new album over two weeks of intensely creative development at the Foo Fighters' studio in the north of the city. I was lucky enough to be travelling to California at the time with JJ, the famous Japan based music producer (you should hear his track for Fall Out Boy by the way). He knew the guys and they invited us to the studio one evening to enjoy a recording session (David Grohl was out of town before you ask). The studio was an incredible mix of guitars, amps and gold records and the recording desk itself had a legendary status having been used in the mid-seventies to lay down the tracks of Fleetwood Mac's Rumours album amongst others. And yes, I did lay a very reverent hand upon the hallowed machine. But the story is not about getting lucky and having the chance of visiting the home of some of the world's most successful music. The point is these Japanese guys, who spoke little English, had looked overseas and taken a risk and, in the days of introspection, they're setting a great example for the youth of their home country. In the era of global communication, they're embracing the globe. And I have to admit, I like that. 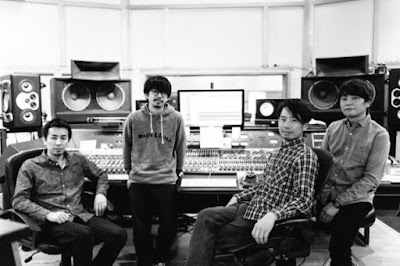 ASIAN KUNG-FU GENERATION at the Foo Fighters' studio in Los Angeles. And the awesome Barefoot speakers in the background.